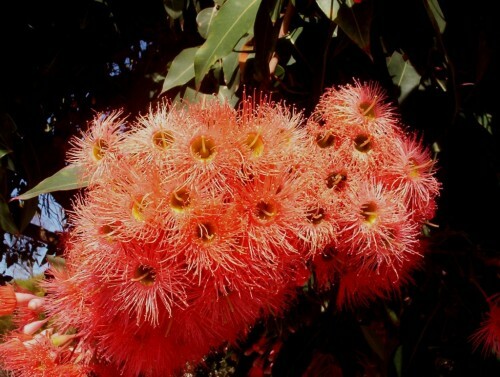 I kept seeing the masses of flowers on this Eucalypt and could not think of its name. The flower display had me fooled as I have not seen such a prolific flowering like it is this season. 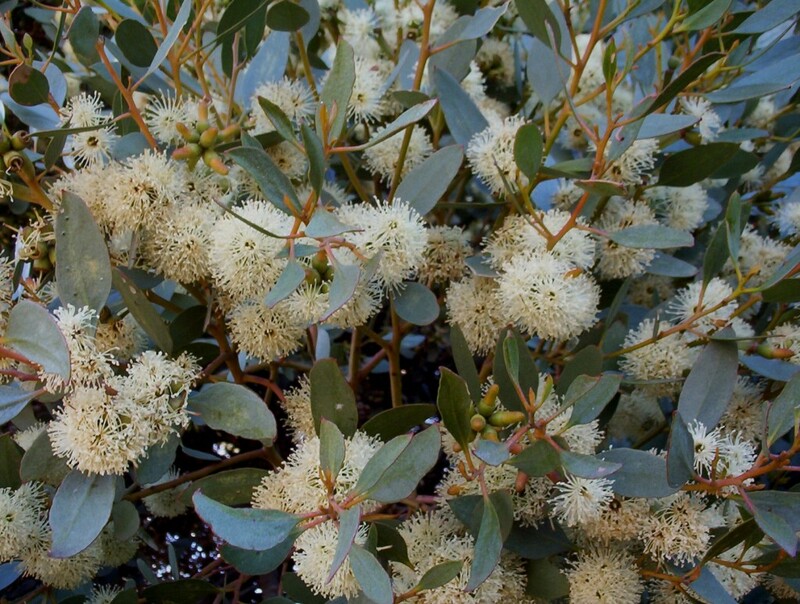 Eucalyptus platypus is a popular tree around here, being used in wind breaks and as screening plants. It wasn’t until I went to photo the tree that I realised what it was. 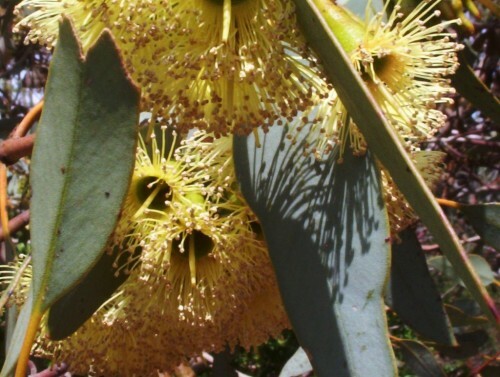 It is named Eucalyptus platypus because the flower stem and buds resemble the foot and claws of this Australian Native animal. I was hoping to be able to take a photo of the Purple-Crowned Lorikeets in the canopy of Eucalyptus stricklandii. 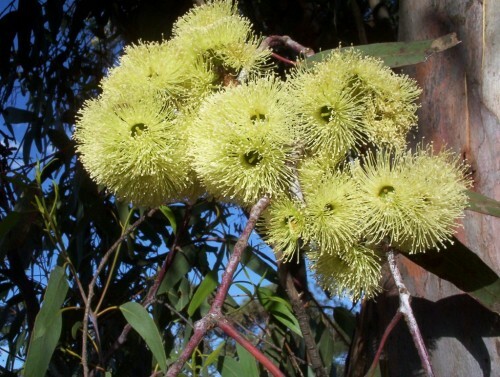 They are rowdy birds when feeding on the prolific nectar supply of this Eucalypt and others in the town. This tree is highly valued for its nectar production. This also could be called ‘the perfect tree’. It is adaptable to many different soils including alkaline. It is ideal for arid and semi arid areas and warm temperate areas. Apparently it does not do so well in cold climates. It is useful for wind breaks and erosion control. 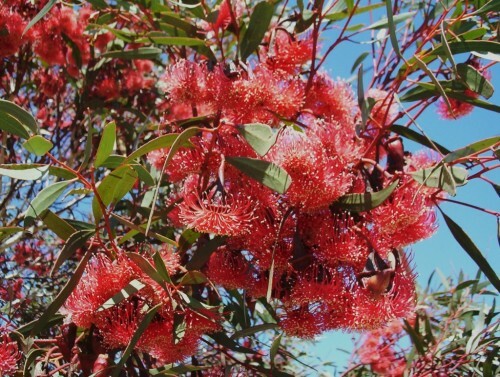 The tree grows from 6-12 metres tall by 5-8 metres wide. Here it is the lower height. It is drought and frost hardy and resistant to smog. Flowering time is Spring through to Autumn. This tree has been grown in Israel without irrigation and is also grown in California. A good photo of a Puple-Crowned Lorikeet can can be seen on the site of The Australasian Bird Data Base. This delightful shrub had only been a name and description until I came across it growing at the entrance gate to Medika Art Gallery at Blyth in the mid north of South Australia. The owner of the gallery is also a keen propagator of Australian native plants. Eucalyptus pimpiniana grows to about 2 metres. It grows in western South Australia where it is classed as rare. Flowering is from December to June and the Honeyeaters love it. One book I read says that frost tolerance is not fully tested. In Blyth it would have survived very severe frost this last winter. This is a plant for dry areas and full sunshine and also alkaline soil. I think it would also make a magnificent potted plant in a large tub. 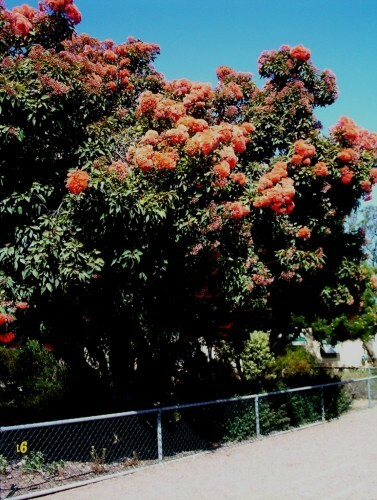 I found this tree flowering in my fence line planting and as a street tree in one of the smaller nearby towns. 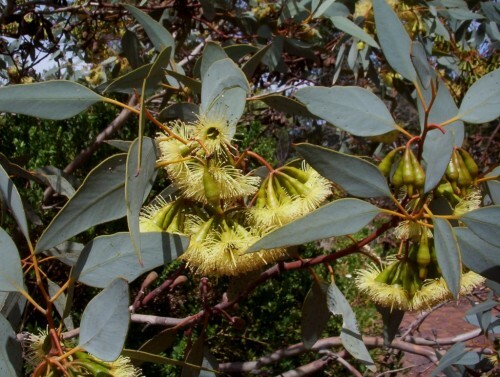 Eucalyptus kingsmillii is a Western Australian species which is mallee shrub or small tree 4-8m tall by 3-6m wide. We had Mistletoe birds nesting in one of the trees in the windbreak. It was the first native bird to nest in a tree which we had planted. After a storm one day I discovered that the neighbour had found the nest about to collapse and it had eggs in it. She found a stocking and slid a length of it over the nest and tied it securely to the tree. The birds continued to sit and raise the chicks. Our plants have brilliant red flowers but apparently it is often yellow. They originate in very arid areas and need good drainage and a warm aspect. They are drought tolerant and moderately frost tolerant. Eucalyptus kingsmillii is highly suited to gardens, parks and roadside planting. It can be cut for floral decorations. Apparently this is a plant grown in California. A photo and article on Mistletoe Birds can be found here. This tree is obviously drought and frost hardy here and grows in alkaline soil, which breaks all the rules if the books are to be believed. The issue is, I think, that many species are quite adaptable and noone has the full story on all species. This tree is one of those. It has large fruits which are urn shaped and very decorative. Many use them for crafts and they are fun to create things with children.